Sometimes, it’s the smallest jobs that can be the most difficult and time-consuming. With Little Wonder edgers and crack cleaners, you can get sharp edge on landscape features and clean soil and other debris from pavement cracks to give landscaping a quality finish with minimal effort. It doesn’t just make your work look more professional, it can lead to serious savings on labor costs. This edger is designed to get a clean transition between turf and tilled soil, making it perfect for outlining ground cover, flower beds, and gardens. This tool is designed first and foremost to handle the curves used in these landscape features. It has a hydrostatic drive with variable speed control in forward and reverse and places the blade is in line with the wheel, making it easy to guide. The drive axle has a differential, allowing different wheel speeds for easy turns with minimal scrubbing, and it has a zero radius turning during transport to get the blade lined up for the next cut. Thanks to a powerful Honda GXV390 engine, this machine can cut up to 100 feet per minute, even when turning. The notched blade’s concave shape cuts at an angle to help blend in cuts for an even finish. It can be set in one of 7 positions to get a cut ranging from ½ to 4 ¼ inches. Little Wonder’s BladeFloat system lets the blade glide over obstructions and still cut through the soil, keeping the cut even on the surface with minimal stops. The blade is driven by a belt drive that is fully enclosed and has a spring-loaded idler pulley to eliminate the need for adjustments. At their core, the Pro Edge and Pro Crack Cleaner are the same machine, just set up for different purposes. In fact, they’re so similar that Little Wonder has kits to convert the Pro Edge into a concrete cleaner and the Pro Crack Cleaner into an edger. Both models have a dual belt drive for less slippage and better power transfer. These belts are protected from debris by a full-length shield. Whether it’s fitted with a brush or a blade, the head height has four inches of adjustment. These tools are supported by four wheels, eliminating the need for a curb wheel. Every wheel is mounted on steel hubs with ball bearings and full axles for durability and smooth rolling. When working on uneven surfaces, the front wheel height can be adjusted for stability. The operator is protected by a mud flap that extends below the main shield and a set of anti-vibration grips that quell bumps and engine movement. The Pro Edger cuts into soil along the edge of pavement using a 10-inch steel blade. This blade is surrounded by a cast iron guard to deflect debris. 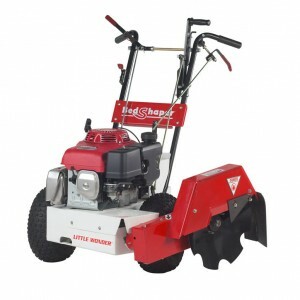 Little Wonder offers this model with either a Briggs & Stratton Intek 550 or Honda GX120 engine fitted with an extra large gas tank. It can edge up to 90 feet per minute. The Pro Crack Cleaner is only available with the Honda GX120. It uses a 9-inch diameter twisted wire wheel brush to pull debris out of pavement cracks. It’s perfect for cleaning up concrete and preparing it for sealing. Little Wonder guarantees the BedShaper, Pro Edger and Pro Crack Cleaner for one year of use, while the blade on the BedShaper has a lifetime guarantee against chipping, breaking, bending and delaminating. Briggs & Stratton guarantees the Intek engine for two years of residential use or one year of commercial use, while Honda guarantees their engines for three years for all users. Do you need a BedShaper, Pro Crack Cleaner or Pro Edger to help you get lawn care tasks done faster? Do you need parts or service for your Little Wonder equipment? Shank’s Lawn Equipment is a certified dealer for Little Wonder, Honda and Briggs & Stratton so we can help you get the equipment you need and keep it running. We’re located at 4900 Molly Pitcher Highway in Chambersburg, PA. That’s one mile East of I-81 via Exit 10 to Marion. Not in the area? We ship OEM parts across the U.S. and Canada. To order, visit our website, www.shankslawn.com. This entry was posted in Uncategorized and tagged Bed Shaper, Edger, Little Wonder, Shank's Lawn. Bookmark the permalink.